NDT Global recently introduced the enhanced sizing capability to its ultrasonic (UT) crack inspection service. 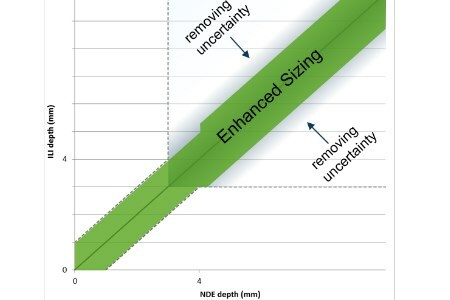 Before the introduction of enhanced sizing, there was an industry-wide uncertainty for crack depth sizing for depths anywhere above 4 mm (0.16 in.). Previously, for flaws above this threshold, a level of uncertainty existed. While the sizing of cracks with depths above 4.0 mm (0.16 in.) was feasible, the uncertainty associated with it lead operators to adopt a conservative approach in their pipeline integrity management programmes. Anything above the 4.0 mm threshold was previously subject to speculation. There was no level of certainty when it came to sizing cracks in this range. With its new enhanced sizing capability, NDT Global removed this limitation. The innovation brings with it highly accurate depth sizing up to 100% wall thickness. Conducting in-house research and expertise. Testing – small and full scale. Presenting the solution to market. With more accurate and in-depth information about their pipelines, operators now have the ability to conduct a more proactive, rather than reactive, integrity management programme. The removal of the limitations of existing crack inspection processes provides operators with more accurate data for better-informed decision making about their pipelines. With this in mind, the introduction of more accurate information will ultimately result in safer pipelines.